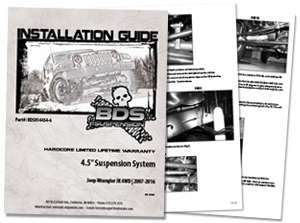 BDS Suspension lift kit instructions are written to shorten your installation time. They are the most accurate, complete, and installer friendly instructions in the off road industry. This is where you'll find the latest version of our instructions for Chevy, Dodge, Ford, GMC, Jeep, Hummer, Mazda, Nissan, Suzuki, and Toyota lift kits and 4wd accessories.